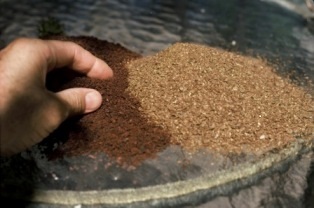 The natural way to fertilize is to feed the soil and let the healthy soil feed the plants. Creating biological activity is the goal. The overall program is to apply a natural organic fertilizer three times a year: early spring, early summer and fall. Apply an organic fertilizer to all turf and planting beds at 20 lbs. per 1000 square feet. Repeat every 60 to 90 days during the growing season if greater response is needed. Apply rock powders annually at about 40-80 lbs. per 1,000 square feet. The best choices include Azomite, lava sand, basalt, and other volcanic materials. This is not necessary if you have volcanic soil. One of the many advantages of the natural organic program is that fertilizer can be applied any month of the year. During the growing season, spray turf and all plantings monthly with compost tea, molasses, apple cider vinegar and seaweed mix. This mixture is basically the Garrett Juice formula. For more details, click here. Fertilize all planting areas with a natural organic fertilizer such as Espoma, Good Natured or Medina at approximately 20 lbs. per 1,000 square feet (follow label instructions). Corn gluten meal can be used but timing of application is critical for weeds such as bluegrass, dandelion, henbit, fescue grass, ryegrass, and Poa annua. Add rock minerals if not recently done. Choices include Azomite, lava sand, zeolite, granite sand, greensand, humate products, calcium products, etc. Spray plants and drench roots of with Garrett Juice. Avoid all synthetic fertilizers but especially “weed and feed types” and the “nitrogen only” types. Remember that the only complete, balanced fertilizers are natural organic. Others contain no carbon and poor compliments of trace minerals.